As science and technology advance, more life forms are found in extreme environments. An assortment of "simple" life forms, and even more complex, can survive radiation, heat, cold and more (such as tardigrades). They present a tremendous challenge for evolutionists to explain how and why they evolved. Not so much for the creationist, however. Could anything live in a boiling mudhole? Actually, in recent years, many new species have been discovered in many places which were thought to be far too inhospitable to support life. Not just in boiling mud, but in steaming volcanic craters, in the rocky chimneys that grow above deep-ocean volcanic vents spewing forth hot salty water (‘black smokers’), in areas of extreme cold in the Antarctic, and even in the hyper-salty Dead Sea in Israel, a treasure trove of living organisms has been revealed. These ‘extremophiles’ (Greek -philos = ‘loving’) can tolerate astonishing extremes of temperature, acidity, pressure, dryness and salinity. 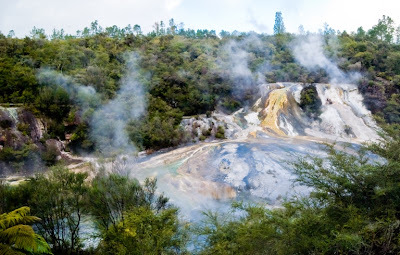 For example, Sulfolobus solfataricus can survive to 88ºC (190ºF) near fuming sulfurous volcanic vents (see photo in Creation magazine p. 42). Pyrococcus furiosus (‘furious fireball’) tolerates 100ºC (212ºF). Even more amazing is Pyrolobus fumarii, which lives within the walls of black smokers, and which not only survives, but can actually grow at temperatures up to 113ºC (235ºF). Ferroplasma acidarmanus thrives in acid mine drainage (pH0) in California—a brew of sulfuric acid and high levels of arsenic, cadmium and other toxic chemicals. Read more about these challenges to evolution at "Life at the Extremes". Music Video and Links: He Has Risen!